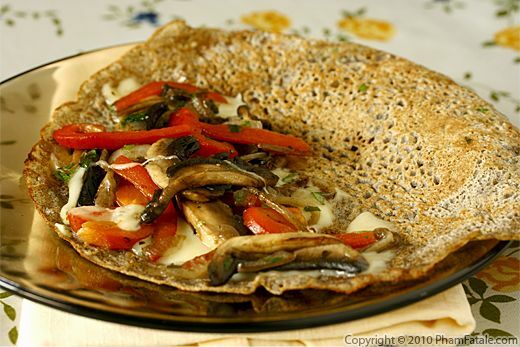 Galettes de sarrasin, also known as galettes de blé noir, are savory crêpes made from buckwheat flour. 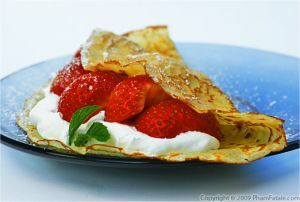 They're also called crêpes bretonnes (Breton-style) as the dish originated in Brittany, France. 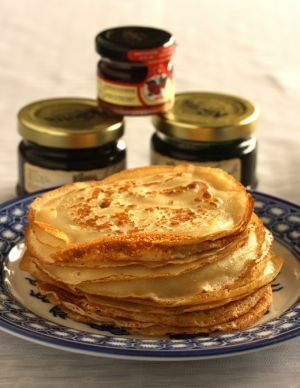 The lacy crêpes are made in a very similar manner to sweet crêpes, but the difference is that buckwheat crêpes are cooked only one one side. Originally, the "true" galettes were supposed to be served plain with salted butter, but these days, they're usually garnished with charcuterie meat, smoked fish, cheese or vegetables. The most popular version is called La complète which is composed of ham, emmenthal cheese and a cracked egg cooked directly on top of the galette. Another common one, La soubise, is filled with caramelized onions and salted butter. I filled mine with sautéed button mushrooms, red bell peppers and raclette cheese. If you're only familiar with sweet crêpes, it's definitely worth giving these buckwheat crêpes a try. C'est absolument délicieux! Using a handheld mixer, whisk the eggs until foamy. Combine the flours and salt in a bowl. Sift the dry ingredients. Form a well in the center of the bowl. Pour in the eggs and ½ cup of water. Mix by hand for about 3-4 minutes until the batter is smooth. Do NOT over-mix. Add the oil. Let the crêpe batter rest for at least 2-3 hours (I let it rest overnight). Thin the crêpe batter with about 1/3 cup of water (up to 2/3 cup). Place your crêpe pan (or any flat pan) over medium heat. Grease it with a little butter using a silicone brush. Pour about ½ cup of the batter in the center of the pan. 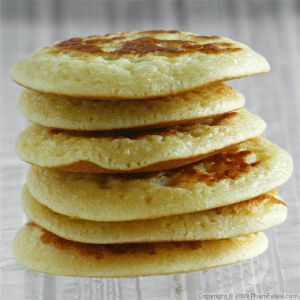 Lift the pan and then tilt and rotate it until the batter is evenly spread and forms a nice thin disk. Put it back on the stove. It should start bubbling after a few seconds. Lower the heat to low. Place a slice of raclette cheese and add a little bit of the button mushroom and red bell pepper filling. Fold the crêpe and let the cheese melt for 1-2 minutes. The traditional method is to fold the edges of the crêpes in on all 4 sides by about 2 to 3 inches; this leaves the filling exposed. Repeat until all the ingredients are used. Stir the crêpe batter as you go for uniform consistency. Serve immediately with apple cider served in stoneware cups or kir (crème de cassis mixed with cider). The first crêpe is never perfect. 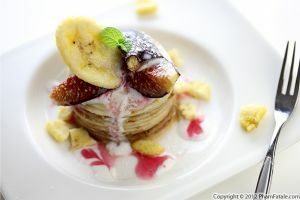 You might want to thin the batter with more water if the crêpe turns out too thick. The best spatula to flip crêpe is the one from Ikea. It's long, flat, heat resistant and gentle on non-stick pans. And it's inexpensive . 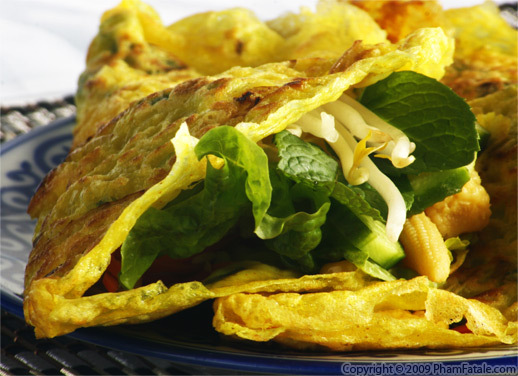 If you're interested in making an Asian version, check out my recipe for banh xeo, it's a Vietnamese crêpe. 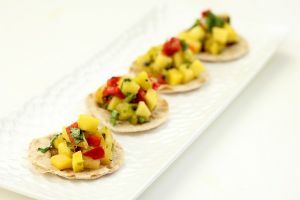 For a vegan version, omit the butter and use only oil instead. I used whole wheat flour for health reasons. You could use all-purpose flour instead (measure 150 grams = 5.3 ounces) but you might want to reduce the amount of liquid. Buckwheat flour (farine de blé noir). 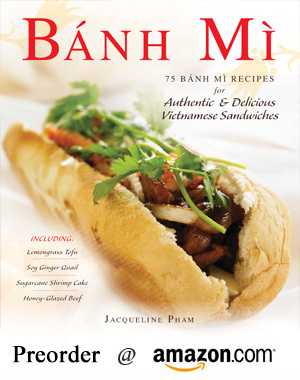 Published By: Jacqueline Pham on April 13, 2010.